1) Judas Maccabeus and his companions entered the villages secretly, summoned their kindred, and enlisted others who had remained faithful to Judaism. Thus they assembled about six thousand men. COMMENTARY: It’s a good strategy, to start under the radar and recruit quietly, getting your numbers up before doing anything rash. Right from the start they’re planning carefully. COMMENTARY: Pity: To have compassion on an inferior, usually assumed to suffer innocently, and to use one’s superiority in a way favorable to this inferior. This establishes two interesting ideas. First, the sanctuary is God’s home base, not to be mistaken, however holy, with God Himself. It exists subordinate to God. Second, the sanctuary, nevertheless, is a person, innocent of the crimes committed within her, whose rights have been violated. One cannot have pity on something that has no rights. One could have argued that the writer uses “The Temple” as a symbol for the community, except that the very next verse addresses the community separately. Nor could it symbolize the priesthood, which earlier chapters have established as totally corrupt. I can only consider this another example of Biblical animism, for the first time (as far as I know) applied to a manmade creation. The concept of God’s superiority to the temple distinguishes this animism from idolatry; it is the creation of a creation of a Creator, which it has pleased God to invest in personhood, not a work of human hands treated like a god. As Tolkien said, we are made in the image of a maker. We make, and we love what we make. Art takes on a life of its own. And if we so love the work of our own hands, how can God not love the work of His? COMMENTARY: Mercy is distinct from pity. Mercy means forgiveness for the guilty, and deliverance from just punishment. The city means both the people and the structures which they have built for themselves, both that which is about to be leveled and that which bleeds. How can the structures share in the sins of its people? Ancient people didn’t have quite the same belief in absolute individualism that we do—While they had some concept of personal responsibility, they mainly thought in collectives, including the belief that the sins of the parents could and should be punished in the child. Devout people built the temple itself, but since then many wicked people had added onto, or torn down and rebuilt, much of Jerusalem, adding in brothels, the controversial gymnasium, shrines to competing deities and many other things not part of their covenant. 4) to remember the criminal slaughter of innocent children and the blasphemies uttered against his name; and to manifest his hatred of evil. COMMENTARY: And here we have the first buds of what would eventually evolve into our modern sense of individuality. Children, at least, could conceivably be innocent of their parents’ faults. This actually began centuries earlier, of course, but such changes in consciousness take millenia to develop. The prophet Jeremiah set a precedent by railing against the sacrifice of children to Moloch, and he prophesied that the Babylonian captivity would result. Historians have long wondered if such sacrifices were slanderous inventions of enemies to Philistine culture. But that’s grounded in the error of thinking that the ancients thought the way we do. Recently archaeologists have found a mass graveyard of infants, on temple grounds, burned and buried in a way consistent only with the rituals described. If you think the way that most of the world thought at that time, sacrificing your child to your deity made sense, as they were an extension of yourself, and you yourself would only be one limb of your family, and that family one finger of your community. Self-sacrificing a part of yourself for the benefit of the whole would seem like a noble and acceptable act. But the Israelites have begun to explore the concept of individuality, that babies are innocent and have an independent life of their own. That parents are guardians, not owners or extensions. Others were slower on the uptake. Roman law, for instance, allowed the patriarch of a familia (a unit that included both kin and subordinates) to kill any other member of his own familia that he saw fit—be they pets, livestock, slaves, servants, ex-slaves, employees, his own children, poor relations, the children of his slaves or his wife. There were two kinds of marriage: one in which a bride’s father ceded this right to her husband, and one in which he kept the right to himself, taking the groom into his own familia. The very concept of “familia” meant “the people who belong to me”. And the Romans founded their entire society on this concept—an individual patriarch headed a private familia, which belonged to the larger familia of the city and its surrounding countryside, which belonged to its country, which belonged to the empire. Everybody belonged to somebody. 5) Once Maccabeus got his men organized, the Gentiles could not withstand him, for the Lord’s wrath had now changed to mercy. 6) Coming by surprise upon towns and villages, he set them on fire. He captured strategic positions, and put to flight not a few of the enemy. COMMENTARY: This might seem like a pretty strange example of wrath changing to mercy! But the wrath of God here means turning His back in disgust to let His people suffer the consequences of their own folly, and his mercy means facing them again to fish them out. 7) He preferred the nights as being especially favorable for such attacks. Soon talk of his valor spread everywhere. COMMENTARY: So did Che Guevara, and he recommended it in his guidebook on guerilla warfare. And that is exactly what kind of warfare Judas engages in. Guevara was raised Catholic; I wonder how much of his strategy he learned from the books of the Maccabees? I see some interesting parallels. 8) When Philip saw that Judas was gaining ground little by little and that his successful advances were becoming more frequent, he wrote to Ptolemy, governor of Coelesyria and Phoenicia, to come to the aid of the king’s interests. 9) Ptolemy promptly selected Nicanor, son of Patroclus, one of the Chief Friends, and sent him at the head of at least twenty thousand armed men of various nations to wipe out the entire Jewish nation. With him he associated Gorgias, a general, experienced in the art of war. COMMENTARY: All this we covered before in 1 Maccabees. 10) Nicanor planned to raise the two thousand talents of tribute owed by the king to the Romans by selling captured Jews into slavery. COMMENTARY: King Antiochus owed this to Rome due to the Treaty of Apamea, after losing the Battle of Thermopylae, the Battle of Magnesia, and various naval battles. As a result the Seleucid Empire had to quit all claims to Europe, and all of Asia west of the Taurus Mountains. Antiochus had to surrender all prisoners and deserters to Rome. Plus, he could neither hire mercenaries from Roman territories nor harbor Roman fugitives. He had to send twenty hostages to Rome, selected not by him but by the Roman Consul, and 19 of them would be changed for new hostages every three years (long enough to Romanize them) the 20th being his son, who became their hostage for as long as they saw fit. The treaty also banned him from owning elephants. And he had to surrender to Eumenes II, the King of Pergamom, whatever possessions he had left that he had acquired by his agreement with Attalus I, Eumenes’ father. And, relevant to this discussion, he had to pay back to Rome the cost that they’d incurred in defeating him. He had to make a down-payment of 500 Euboic Talents, 2,500 more with the ratification of the treaty, and 1,000 a year for twelve years. Hellenistic nations understood such treaties to be binding for the lifetime of the king who made them. Heirs did not have to abide by treaties signed by their predecessors, however. This will matter later. There will be elephants. 11) So he immediately sent word to the coastal cities, inviting them to buy Jewish slaves and promising to deliver ninety slaves for a talent—little anticipating the punishment that was to fall upon him from the Almighty. COMMENTARY: Ninety slaves for a talent is a ridiculously low price by market values at the time, thereby undercutting anybody else in the slave market. Antiochus needed quick cash. It also showed his contempt for Judea. 12) When Judas learned of Nicanor’s advance and informed his companions about the approach of the army, 13) those who were fearful and those who lacked faith in God’s justice deserted and got away. COMMENTARY: The other version said that Judas dismissed them. Maybe he dismissed them after the fact, “making a virtue of necessity”, as my grandmother would have said. 14) But the others sold everything they had left, and at the same time entreated the Lord to deliver those whom the ungodly Nicanor had sold before even capturing them. COMMENTARY: They liquidated assets that they were not going to be able to enjoy any time soon, and might never enjoy again. Antiochus was not the only one in need of quick cash. As for selling pre-captured slaves, the futures-market has always been a risky business. 15) They entreated the Lord to do this, if not for their sake, at least for the sake of the covenants made with their ancestors, and because they themselves invoked his holy and glorious name. COMMENTARY: As we will see later, not all of the forces marching behind Judas followed the strict Jewish ban on worshiping competing deities, and were in no position to ask God’s aid as a reward for the purity of their devotion. But they were turning to Him now, and hoped that this would be enough. 16) Maccabeus assembled his forces, six thousand strong, and exhorted them not to be panic-stricken before the enemy, nor to fear the very large number of Gentiles unjustly attacking them, but to fight nobly. 17) They were to keep before their eyes the lawless outrage perpetrated by the Gentiles against the holy place and the affliction of the humiliated city, as well as the subversion of their ancestral way of life. COMMENTARY: If you can’t hearten your followers by the strength of their position, you have to hearten them by the rightness of their cause. COMMENTARY: It helps believers, in desperate circumstances, to remember that God can do anything. This in turn can open up another can of worms—if God is indeed all-powerful, why is there so much suffering? The answer commonly given is that God has forbidden Himself to interfere with free will. We, judgmental as we are, without the resources to judge fairly, like to assume that this means anyone who suffers deserves it—that way we can convince ourselves that if we do everything right, what has befallen our neighbor will not befall us. That simply is not true. A long history of martyrdom shows that God doesn’t work that way, but we keep clinging to the idea that if we could just manage to be perfect no bad thing would ever befall us. I’m sure those who jeered at Christ on the cross thought so. A better answer is Job’s: we don’t know God’s plan. We can’t. The mind that could create the entire universe encompasses things that we can’t begin to fathom. One thing for sure, though, not every misfortune is a punishment. Sometimes it involves other people exercising their free will badly and we get caught in the mess that they create. Why, for instance did the Holocaust happen? Because in a world of free will, sooner or later someone will do their worst. But we must not also ignore how many more people, throughout history, have tried to see just how good they could be. More often, it has been my experience that many seeming tragedies carry hidden blessings. My narcolepsy, for instance, has driven me into dreamwork. I have fibromyalgia, and it has pushed me deep into the mysteries of offering up my pain to pull pain off of others. Sometimes people suffer a little while so that they might be healed. Jesus spoke of this when healing the man blind from birth—he wasn’t blind for any sin, either of his own or his parents, but so that he could demonstrate God’s ability to heal. Judas invokes this second kind of hope to encourage his warriors. Whatever might come to pass in the coming battle, it will go as God wills. They simply have to do their best to be a part of that. COMMENTARY: He’s referring to 2 Kings 19:35, when the Israelites found the camp of a seemingly unbeatable enemy abandoned, full of 185,00 corpses, with the survivors in retreat. There could well be any number of natural explanations, but one could also expect a Creator to prefer using His creation to effect His will rather than going against it. We want God always to work in miracles for the sake of our doubts, but why should He? Part of our fall, I think, is that we dismiss too much as “only” natural, ignoring where nature comes from. And yes, I do believe in miracles. I have seen miracles. I just don’t consider them requisite for my faith. 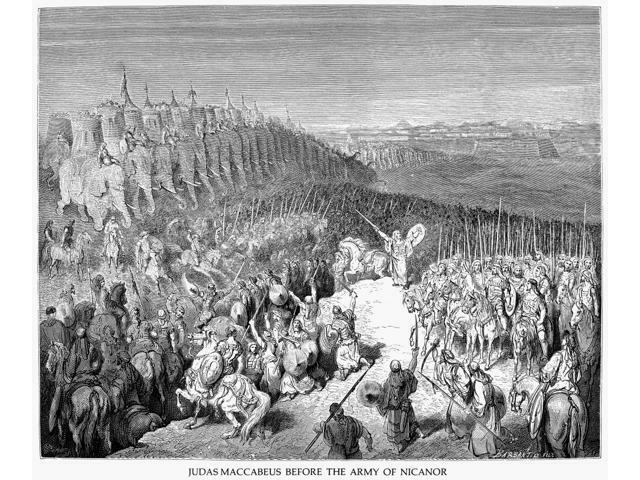 20) and the time of the battle in Babylonia against the Galatians,* when only eight thousand Jews fought along with four thousand Macedonians; yet when the Macedonians were hard pressed, the eight thousand, by the help they received from Heaven, destroyed one hundred and twenty thousand and took a great quantity of spoils. COMMENTARY: Historians only know about this battle that the Galatians were apparently mercenaries, but haven’t placed which battle they fought in. Since we have no date, the Macedonians might have been Alexander’s forces defending the eastern seat of their empire, and the Jews acting as part of that empire, or they might have been mercenaries, themselves. The thing is, not all histories mention which part of an army were mercenaries and from where. Whatever the case, the battle had a place in Jewish oral folklore, enough that it meant something to the Judeans. The tale probably did not survive among the Egyptian Jews, however, because the writer goes into more detail about it than the prior example. 21) With these words he encouraged them and made them ready to die for their laws and their country. COMMENTARY: Good battle strategy. A divided force under separate generals has more flexibility on the battlefield than a great single force trying to follow the orders of one man, with no better means of communication than distant horns and banners. It’s a proverb among soldiers that “All battle plans fall apart in the first four minutes of engagement.” Memorizing a single commander’s orders won’t work. You start out with the best strategy you can, and then improvise as you go when reality smashes it to bits. Hopefully, one of the contingency-plans you made fits the new scenario. If not, well, there’s a reason why poets had the best odds of survival in combat situations during the Viet Nam war, when the U.S. military made a survey of draftees and their survival-rates to see which background most suited a soldier. 22) placing his brothers, Simon, Joseph, and Jonathan, each over a division, assigning them fifteen hundred men apiece. COMMENTARY: In 1 Maccabees “Joseph” was called “John”. Maybe this writer wanted to prevent the reader from confusing him with Jonathan and took a bit of a liberty. 23) There was also Eleazar. After reading to them from the holy book and giving them the watchword, “The help of God,” Judas himself took charge of the first division and joined in battle with Nicanor. COMMENTARY: Eleazar, whose chief claim to fame was slaying an elephant and dying in the same battle, was no doubt a courageous warrior, but probably not as strategically minded as his brothers. And why give command positions to his brothers rather than choosing someone by his merits? Non-hereditary postings were a rarity and hard for the ancient mind to wrap their heads around. At best a leader picked the likeliest candidates in the designated family. In fact merit-promotions with complete disregard for bloodline was the innovation that made Ghengis Khan an unstoppable force, centuries later. 24) With the Almighty as their ally, they killed more than nine thousand of the enemy, wounded and disabled the greater part of Nicanor’s army, and put all of them to flight. COMMENTARY: Wounding meant a lot more in an age without any idea of where infections came from. 25) They also seized the money of those who had come to buy them as slaves. When they had pursued the enemy for some time, they were obliged to return by reason of the late hour. COMMENTARY: So now Judas can buy arms and armor for his men, and deprive Antiochus of much-needed funds besides. 26) It was the day before the sabbath, and for that reason they could not continue the pursuit. COMMENTARY: This was before they decided that the Sabbath didn’t apply to warfare, apparently. 27) They collected the enemy’s weapons and stripped them of their spoils, and then observed the sabbath with fervent praise and thanks to the Lord who kept them safe for that day on which he allotted them the beginning of his mercy. COMMENTARY: Winning this battle would mean a lot more to a people who had been subjugated for centuries. 28) After the sabbath, they gave a share of the spoils to those who were tortured and to widows and orphans; the rest they divided among themselves and their children. COMMENTARY: This is the balance missing in modern debates between socialism and capitalism. Taking care of your citizens in need is not incompatible with a reasonable profit. On the spiritual level, one could see care for unfortunates as an investment, winning the good graces of the most important Patron of all. For the record, care for the poor, in the Mediterranean world at least, was a peculiarity of the Jews at the time. In Greco-Roman culture charitable works meant bankrolling public institutions, such as temples, gymnasiums, theaters, racetracks or public baths. One might toss a little money individually to a beggar as a means of establishing one’s superiority, but organized charities for the unfortunate risked angering whichever deity beggars had offended that brought their troubles upon them. (See earlier comments on the human predilection for ascribing bad luck to bad behavior.) This was why Christianity, carrying the Jewish idea of charity with it, spread foremost among the poor in its first rush outward. 29) When this was done, they made supplication in common, imploring the merciful Lord to be completely reconciled with his servants. COMMENTARY: They’re smart enough to know that one battle doesn’t make them victors. 30) They also challenged the forces of Timothy and Bacchides, killed more than twenty thousand of them, and captured some very high fortresses. They divided the considerable plunder, allotting half to themselves and the rest to victims of torture, orphans, widows, and the aged. COMMENTARY: Might doesn’t make right. It’s what you do with might that matters. 31) They collected the enemies’ weapons and carefully stored them in strategic places; the rest of the spoils they carried to Jerusalem. COMMENTARY: Smart move. Those with the home advantage can pretty much know where the major battles will be fought. 32) They also killed the commander of Timothy’s forces, a most wicked man, who had done great harm to the Jews. 33) While celebrating the victory in their ancestral city, they burned both those who had set fire to the sacred gates and Callisthenes, who had taken refuge in a little house; so he received the reward his wicked deeds deserved. COMMENTARY: As I’ve said before, I wouldn’t wish death by fire on anyone. But people like punishments to fit the crime—unless they themselves feel a need for mercy. People thirst for irony. 34) The thrice-accursed Nicanor, who had brought the thousand slave dealers to buy the Jews, 35) after being humbled through the Lord’s help by those whom he had thought of no account, laid aside his fine clothes and fled alone across country like a runaway slave, until he reached Antioch. He was eminently successful in destroying his own army. COMMENTARY: And here we have ample irony to satisfy the aforementioned thirst. 36) So he who had promised to provide tribute for the Romans by the capture of the people of Jerusalem proclaimed that the Jews had a champion, and that because they followed the laws laid down by him, they were unharmed. COMMENTARY: So now Judas has made an irreversible choice not to fly under the radar any longer.